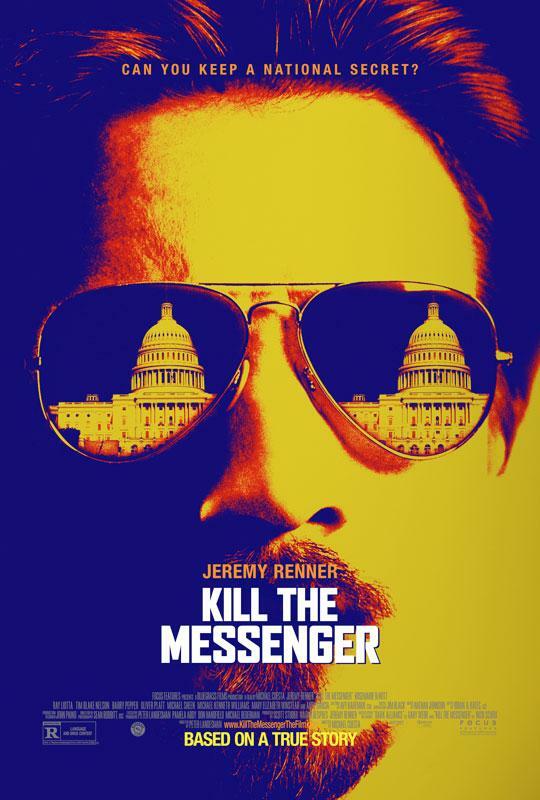 The movie poster for 'Kill the Messenger' starring Jeremy Renner. 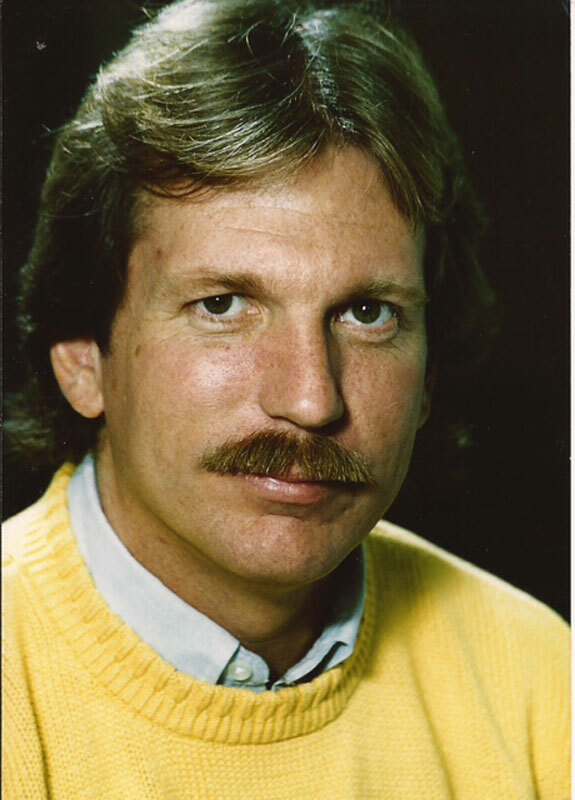 On December 10, 2004 acclaimed and eventually disgraced journalist Gary Webb was found dead from two gunshots to the head. The death would be ruled a suicide. After a struggle with depression and what should have been a career making story in 1996, that ended up destroying his career, Webb was no longer actively working in journalism by the time of his death. But long before the “Dark Alliance” series that revealed a connection between the CIA and cocaine distribution, Webb was a young journalist with big dreams. He served as Arts & Entertainment Editor at The Northerner, here at NKU, and spent the beginning of his professional career at the Kentucky Post. Webb’s life ended sadly, but friends, family, teachers and colleagues always remembered the man and journalist they all knew. Cheerleaders toting fake guns and wearing camo march out onto the field at halftime during a football game. Gary Webb, a high school student who’s never really written before, has something to say about it. Webb writes a column expressing his opinions on the cheer routine successfully angering a large portion of the student body. From that moment on Gary Webb would be a journalist that ruffled feathers and made his mark. In 1974, Webb’s father received a job in Cincinnati. Instead of staying behind to continue attending Indiana University/Purdue University (IUPI), Webb and his brother transferred to Northern Kentucky University. 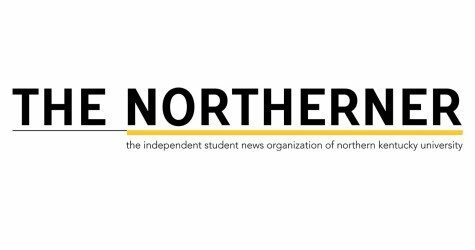 At NKU Webb would be given his first chance to truly venture into journalism at The Northerner. Webb, and Funk as well, were products of the Woodward and Bernstein age. Just as Webb had peaked his interest in journalism during high school, the entire Watergate scandal had occurred and the film starring Robert Redford and Dustin Hoffman would be released just before he began college. Suddenly the idea of being a reporter had become a romantic and cool notion, according to Funk. Webb and Funk would become close, often working beside one another in their entertainment critic roles. Webb, just as he was in life, would write with strong opinions. “We were the cool ones,” Funk joked. Rich Boehne, a former Northerner staffer, wouldn’t work closely with Webb, but was well aware of who he was. “He had one of those bigger than life personalities,” Boehne said. Webb would write countless music reviews and be named Arts and Entertainment Editor, but something beyond the music would catch Webb’s attention. Times were turbulent at The Northerner, Funk said. The paper essentially had a censor, who would read everything they intended to print to approve it. Often though editors, especially Webb and Funk, would print things unseen by the censor. “We were very rebellious,” Funk, now a reporter for the Charlotte Observer, said. 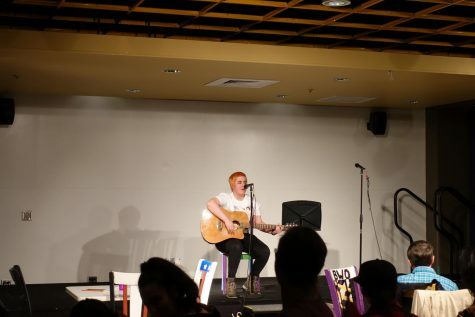 The rebellion would continue with the more controversy that occurred on campus. Funk recalls a time when the university raised parking fees and that was a moment that changed the two entertainment critics. From there they would be true reporters. Webb and The Northerner team were unafraid to call then NKU president Frank Steely out on issues within the university. “Their attitude was that if The Washington Post had gotten a president then they wanted to get a president too. That led to some real trouble between them and Frank Steely,” Michael Turney, a former NKU professor, said. During that turbulence, a small fire would occur during a party at The Northerner. No major damage happened, the building wasn’t even closed down. Shortly after, however the university police would padlock the doors and essentially kick the staff out of the building. Gary Webb (back row center) along with The Northerner team in 1974. A reporter from the Louisville Courier Journal happened to be on campus reporting on the protests about parking and the turbulence. He then heard about the Northerner getting locked out and the next day they were on the front cover of the Louisville Courier Journal the next day. Those events would solidify Webb, and Funk’s, love of investigative journalism. “We were really into it all, we were like ‘forget music and movies lets do the real newsy stuff’,” Funk said. Even in those early days Webb was irreverent in his writing and Funk noticed. While Funk got to know Webb at the newspaper, Turney got to know Webb as a student. “Gary was very bright. He caught on very quickly, he was also very opinionated. He really loved doing things his way,” Turney said. Just as he was in his music reviews and critiques, Webb was always willing to speak up in a class. 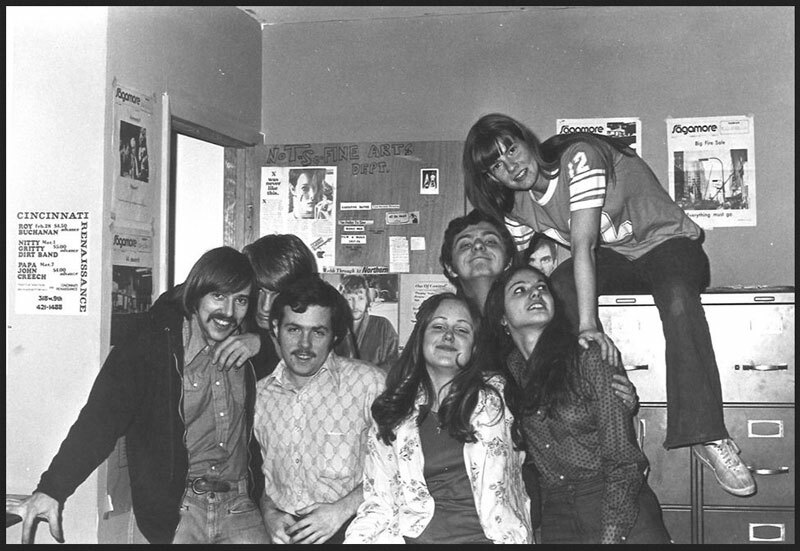 While Webb was a stand-out as a student and as a writer at The Northerner he would leave NKU in 1978 just shy of graduating. Even though he left, his then girlfriend and eventual wife Sue Bell-Stokes could always see how much Webb enjoyed his time at NKU. “He really enjoyed working at the newspaper,” Bell-Stokes said. 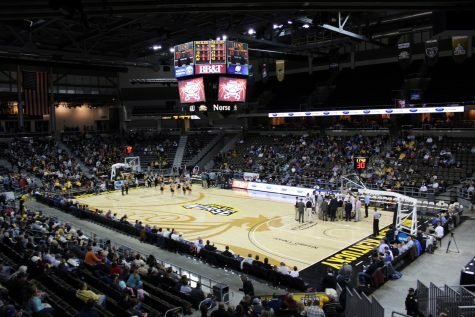 Turney would lose contact with Webb only hearing about him through other students, while Funk would remain in contact for numerous years after Webb left NKU. The two would however lose touch as the years went by, but Funk has always remembered his friend. “Gary just wanted to start being a news reporter,” Funk said. Webb was ready to be in the field for real. So, in 1978, just shy of earning his bachelor’s degree, Webb stepped into the offices at the Kentucky Post. He was young and experiencing what was quite possibly the only case of slight nervousness any of his friends would ever see from him. All he had in his hands was large folder of clips of his work, most of which were music reviews. Compared to other reporters it didn’t look as though Webb was qualified, but it seemed Vance Trimble, the Kentucky Post editor at the time, saw a bright young man. Trimble took a gamble, placing Webb on a few week trial period. That gamble would pay off. The saga of Webb’s professional years would begin inside the humble walls of the Kentucky Post. “He automatically struck me as a personable, friendly, just smart guy,” Tom Loftus, a former Kentucky Post staffer and friend of Webb’s, said. Loftus, now the bureau chief of the Louisville Courier Journal, along with Bill Straub would become incredibly close with Webb during his tenure at the post. While they were close friends they were also strong colleagues. Straub especially would work with Webb on numerous stories and in their work together he got to witness firsthand how Webb worked as a journalist. “He was very aggressive. He was like a bulldog on your ankle once he started on something he wouldn’t quit,” Straub said. Headshot of Gary Webb from 1980 at the Kentucky Post. Loftus saw that same relentless journalist in his days working with Webb. Both Straub and Loftus would marvel at Webb’s ability to comb through pages and pages of records and be able to understand and interpret every bit he read. “He was the kind of person that was never satisfied of an answer unless he knew how that answer came to be,” Dennis Repenning, a neighbor and friend of Webb’s, said. Repenning got to know Webb and his wife at the time Sue Bell-Stokes in Covington where they both lived. According to Repenning, the 20-block radius of homes had a “rather extraordinary gathering of people.” There were lawyers, writers, reporters and judges and they would all gather together to discuss everything. Outside of his work his wife, who knew him best, didn’t just see the hardworker, she saw a lot more. Boehne, who worked at the Enquirer and would join the Post a year after Webb left, remembers the stories he’d hear of the fellow local journalist. From Com-Air plane crashes to coroner races, Webb’s work at the Kentucky Post would pave the way to Webb earning a job at The Cleveland Plain Dealer. At the Plain Dealer, Webb would do what Loftus considered his finest work. 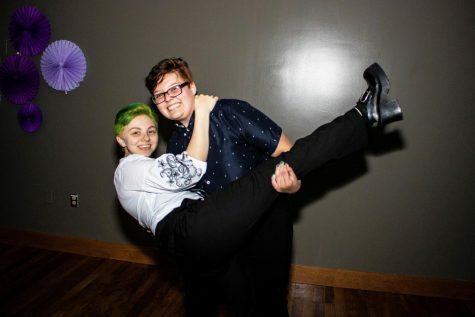 Straub and Loftus would remain in contact with Webb after he left the Post, going on multiple family vacations where they fondly remember Webb’s love of body surfing and the experiencing the best vacations of their lives. Bell-Stokes remembers those trips and the good friends they made while he was at the Post. However, once Webb and his family moved to California they would mostly remain in contact via email. Loftus would ask Webb for his journalistic advice from time to time and catch up, he’d even make one trip to Sacramento to see him. Beyond email, Straub would once encounter Webb during a book tour, passing through D.C.
“He was a great journalist and a great guy at the same time,” Straub said. With his humble Kentucky Post beginnings and his stellar work at The Cleveland Plain Dealer behind him, Webb would begin working at the San Jose Mercury, where his career would be forever changed. In July, 1995, while working at the San Jose Mercury, Webb received a voicemail from a woman named Coral Baca. She simply said she had a story for him, he could have ignored it because of the lack of information she provided. However, it wasn’t in Webb’s nature to ignore, he made a call to Baca, met with her to discuss her drug dealer boyfriend and so began the year long journey to write the story that would both make his career and inevitably break it. Gary would comb through hundreds of records and meet with dozens of sources before releasing the ‘Dark Alliance’ series. The three-part story investigated the roots of the crack cocaine epidemic in the U.S. It would show how the crack market spread from Central America to the western world, revealing that the CIA aided the Nicaraguan Contras in introducing the drug to the West. On August 18, 1996 part one was released both in print and online. The online aspect would be attributed to a large part of why the story blew up the way it did; it would be one of the first stories to be released in the digital form. “It didn’t surprise me that Gary would produce something like that, it was the kind of splash he wanted to make,” Loftus said. “It wasn’t a surprise, if someone was going to break a story like that it was Gary Webb,” Boehne said. Boehne also recalls the dreams they had in college about breaking big scandals like Woodward and Bernstein did with Watergate. “In the wake of Watergate, we all thought we were going to break that big secret the president had or something like that and as it turns out that’s actually what Gary did,” Boehne said. The story was met with acclaim and then criticism came quickly. Major publications like The Los Angeles Times and The New York Times would accuse Webb of having multiple inaccuracies and sources that lacked credibility. 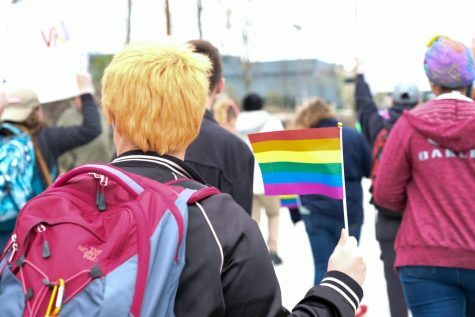 “[A former student doing something like] That comes with a sense of pride and satisfaction, but also a little bit of head shaking because of all the circumstances and the questions about the validity of some of the story,” Turney said. Webb’s story would eventually receive so much heat that his own publication would stop backing him. He was relocated to a smaller bureau, essentially starting from the bottom again. Then Jerry Ceppos, Webb’s executive editor at The San Jose Mercury, would announce he was writing a mea culpa that would admit to faults in Webb’s story. In December, 1997 Webb would leave the Mercury. Though the criticism was heavy, Webb would always stand behind his own story. “The most important thing with that story [“Dark Alliance”] was his courage. He very easily could have decided to bail at any time, but he never did,” Repenning said. In 1998 the CIA would release a 400-page report that would prove a number of Webb’s findings to be true. However, the report would be largely ignored due to media being consumed with the President Clinton, Monica Lewinsky scandal. Webb would never work regularly in journalism again. After Webb’s death in 2004, Nick Shou would pen the novel “Kill the Messenger” chronicling Webb’s life and the story that would end his career. In the book, released in 2006, Shou would use first hand accounts from Webb’s family, former colleagues, critics and supporters. Shou knew Webb and before even beginning he went to Bell-Stokes asking for her permission to write her former husbands story. She trusted in Shou, knowing that he knew the “Dark Alliance” story, and she knew how fond of Shou Gary was. “I knew Gary would be honored to have Nick write it,” Bell-Stokes said. The book would also include first-hand accounts from Webb himself taken from his book “Dark Alliance” which included the three-part series as well as Webb’s account of the process that occurred while he worked on the series of stories. Bell-Stokes found talking about the events difficult, especially so soon after Webb’s death, but knew it was important to tell the story. “It was very emotional reading the book, but it also brought some smiles from when we were younger,” Bell-Stokes said. The book “Kill the Messenger” along with Webb’s book “Dark Alliance” would be the inspiration for the upcoming film. In 2013 it was announced that a film documenting Webb’s “Dark Alliance” journey would be released starring Jeremy Renner (The Avengers, The Hurt Locker). The movie titled ‘Kill the Messenger,’ sharing the title of Shou’s 2006 book, will be released this month. “I wasn’t necessarily into news or journalism, but it’s one of the reasons I wanted to take on the role because journalism itself is interesting to me,” Renner, who plays Webb, said. Jeremy Renner at a press event for ‘Kill the Messenger’. It’s been a long journey to making the film. Sue Bell-Stokes, Webb’s ex, first met with the screenwriter in 2008. 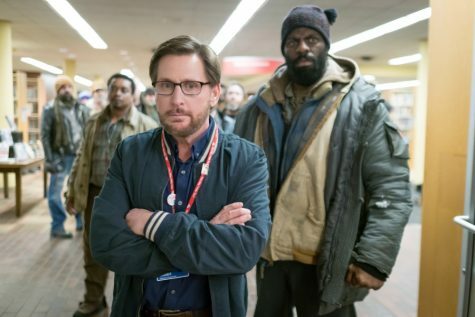 Bell-Stokes would be a consultant throughout the process of the film. “I really like Michael Cuesta [the director], he knows the story really well,” Bell-Stokes said. Renner, who is also a producer on the film, felt the story was important. He couldn’t believe that the events occurred only 70 miles from where he grew up. Michael Cuesta, the director of the movie, felt it was a film he had to do as well and, unlike Renner, he remembered seeing Webb on talk shows when the story broke. Renner not only liked the story, but also the man. For Renner, the family dynamic of the film was very important and playing a man who was real added something to his performance. 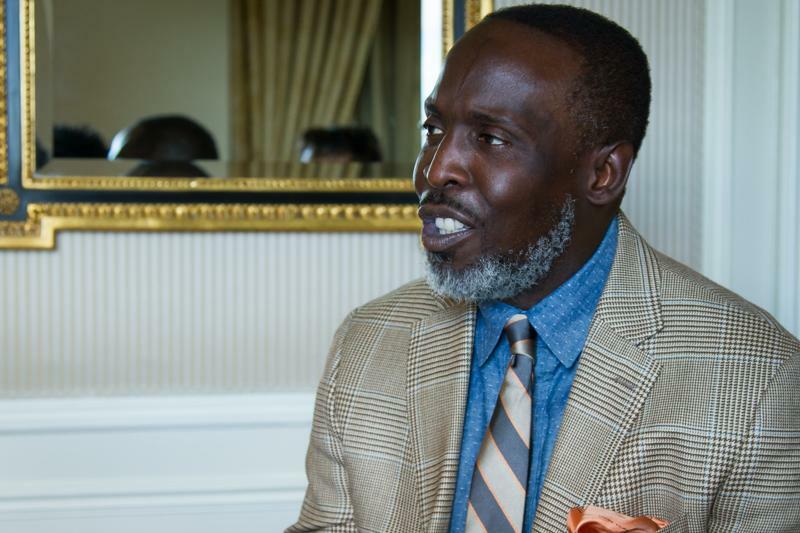 Michael K. Williams (The Wire), who plays drug dealer Ricky Ross, felt the same. Michael K. Williams at a press event for ‘Kill the Messenger’. Williams was granted the opportunity to meet the man he portrays, Renner however will never have that chance. But if he did he’d love to talk to the man Gary Webb, not necessarily the journalist. “What made him laugh, you know, the simplest little things that had nothing to do with his job or anything. Just very personal things, that’s what I’d ask him,” Renner said. Though he didn’t get to know every little thing and Cuesta sees Renner and Webb as two very different men, Renner did find himself having commonalities with Webb. Being based on a true story, Cuesta was posed with the challenge of both telling the story accurately and keeping the story entertaining. “You know the basics of what Gary was like, he was a dogget, Doberman, pushy reporter and he kind of had a cockiness to him,” Cuesta said. With the basics in place Cuesta did take some liberties with the story with the permission of Bell-Stokes. “Things were changed, but heart the of the movie was correct,” Bell-Stokes said. Bell-Stokes has now seen the film multiple times. The first time it was a viewing of the rough cut and she was left feeling numb. By her second viewing they had put the finishing touches on the film and this time she viewed it with her and Webb’s children. Bell-Stokes said they all loved it, there were tears, but we they were all moved by it. The third time was at a friends and family screening which made Bell-Stokes feel happy being surrounded by all those people. Cuesta sees the thriller tropes in the story and knows that as viewers watch Webb get deeper into the story they’ll see it become bigger than him and possibly become an unwinnable war. “Our protagonist does not win in the end, he takes the brunt of everything,” Cuesta said. Even though Webb didn’t win in the end, Renner sees Webb as a hero that was unafraid to go down roads to tell an important story. “He was a warrior with his mind,” Renner said. The film will be released on Oct. 10 nationwide. In 2013, when the film adaptation of Nick Schou’s “Kill the Messenger” was announced, Dennis Repenning, current chair of NKU’s Board of Regents, and Regent Richard Boehne caught wind of the adaptation. Both were personal friends of Webb, and he and Repenning were neighbors. Their work, and the work of Katie Herschede, executive assistant to President Mearns, and The Owens Group, a local public relations firm, have led to a special screening on Oct. 2 at the AMC Theater at Newport on the Levee. According to Herschede, after hearing about the movie, Repenning and Boehne began to write to Focus Features, the film’s production company, in order to explain the connection to NKU and the Northern Kentucky region, to ask permission for the special screening. According to Repenning, out the 11 board members, three knew Webb which is what truly “got the ball rolling” on the screening. Herschede said that the university didn’t hear anything for several months, while the film was in production. However, Focus Features did end up sending a copy of the letter to The Owens Group. NKU was contacted by Jessica Johnston, an NKU graduate who works for The Owens Group, saying that they were very interested in setting up the special screening. “According to them [The Owens Group], it’s very unusual that anyone gets to do any kind of special screening like this,” Herschede said. Michael Cuesta, the director of the film, will be attending screening, and will be holding a discussion afterwards. Sue Bell-Stokes, Webb’s ex-wife who helped as a consultant on the film, will also be attending, according to Herschede. Attendance to the screening is by invitation only.